Members of the Odd Fellows, like many other society members, choose to be buried in common burial grounds. 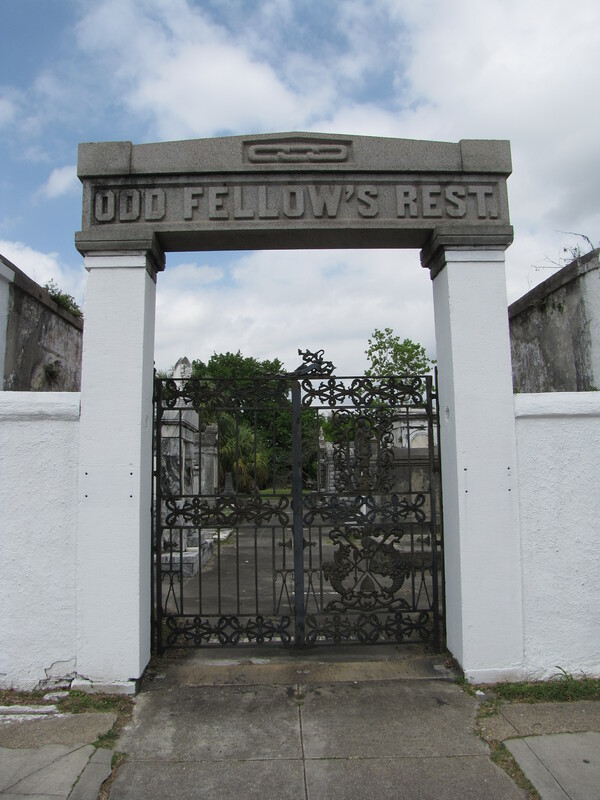 There are several Odd Fellows graveyards in the United States including the Odd Fellows Rest Cemetery at New Orleans, Louisiana. Carved into the lentil of the stone entrance to the cemetery are three links of a chain, the main symbol of the society. Often shown inside the three links are three letters, F L T, which signify the organizations motto: Friendship, Love, and Truth. Unfortunately, much of the intricately manufactured ironwork on the gates to the entrance have been stolen over the years. 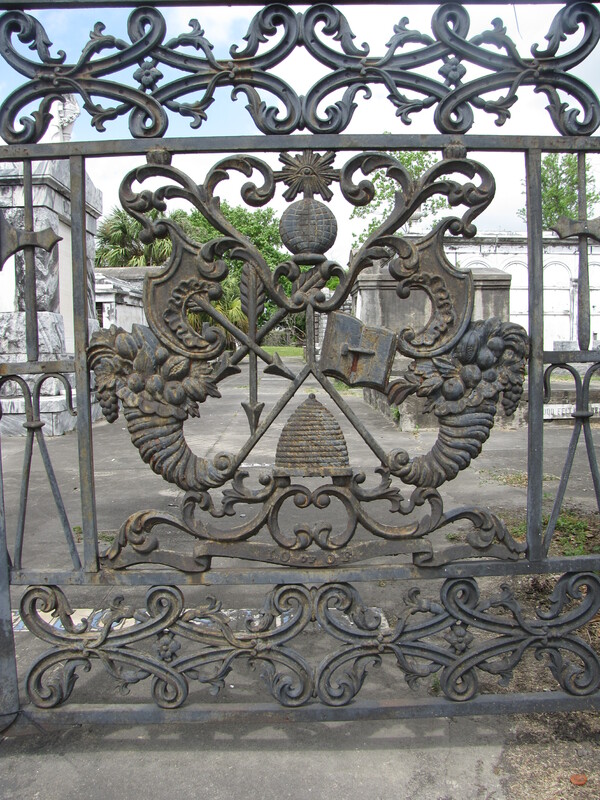 However, what remains on the right door of the gates exhibits a multitude of symbolism. 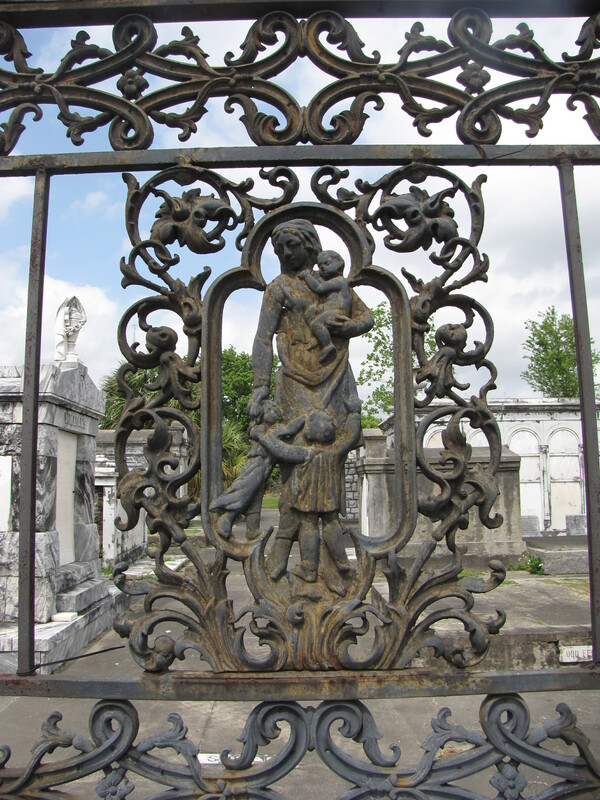 The top panel displays a woman holding a baby with two children cleaving to her skirt, as if they are mourning the loss of a loved one–possibly a member of the Odd Fellows. At the top of the bottom panel of the right door, the ironwork displays the All-seeing Eye of God with rays of light emanating over a globe representing the watchful eye of the Deity overseeing the world. The All-seeing Eye or Eye of Providence can be traced all the way back to the Eye of Horus in Egyptian mythology. On either side of the panel are dual cornucopias which are symbolic of plenty. Inside the cornucopias are two symbols—the open book with a gavel and the crossed arrows and representing law and order. At the bottom of the panel is the beehive, well known as a symbol of industry.